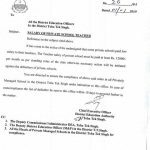 Office of the Executive District Officer (Education), Toba Tek Singh has also issued order No. 1758/EM-SE(2014)V-2, No. 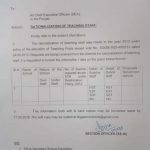 1760/EM-SE(2014)V-2 dated 22-03-2014 in connection with the Re-Allocation of Teaching Posts/Staff in Toba Tek Singh. 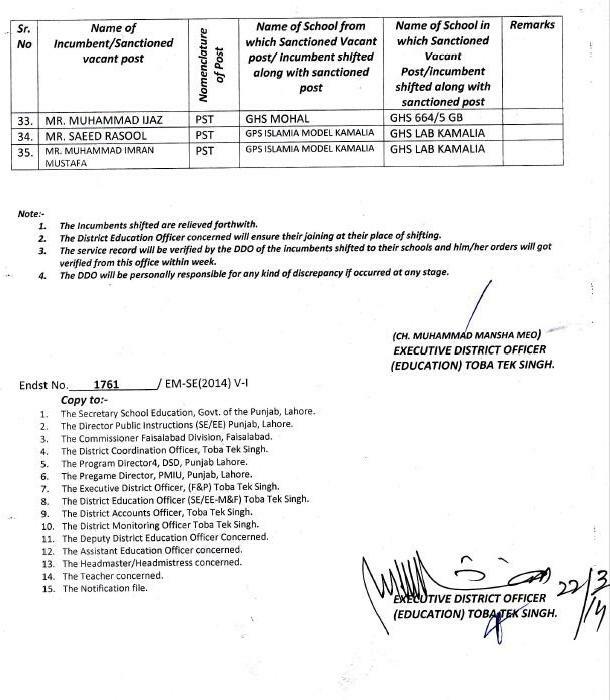 In compliance School Education Department Notification dated 26-06-2013 & 21-03-2014 and the approval of the District Committee Toba Tek Singh, the surplus staff of various schools has been shifted alongwith sanctioned post to the schools mentioned in the list. 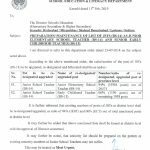 It has been done due to re-allocation of teaching staff as per Student Teacher Ratio with immediate effect. 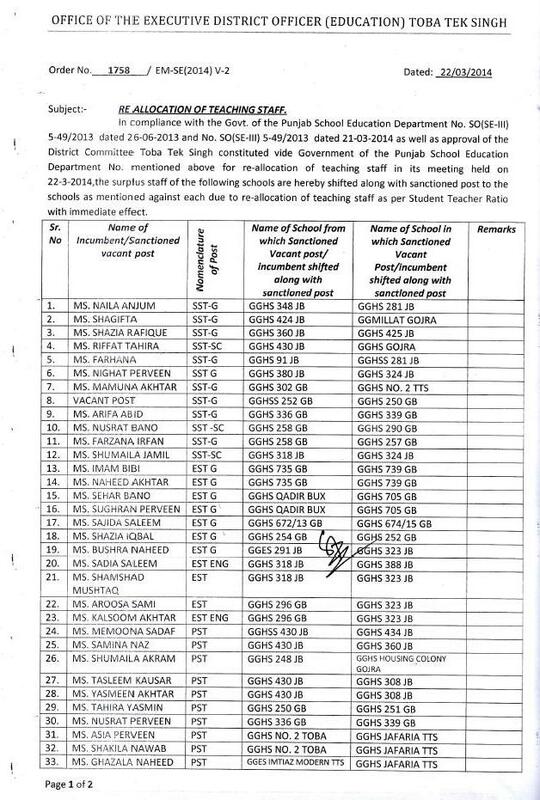 Accoring to these orders Primary School Teachres (PSTs), SSTs, SSTs (SC), SST (G), EST (G), EST (V), EST (Eng) have been shifted. 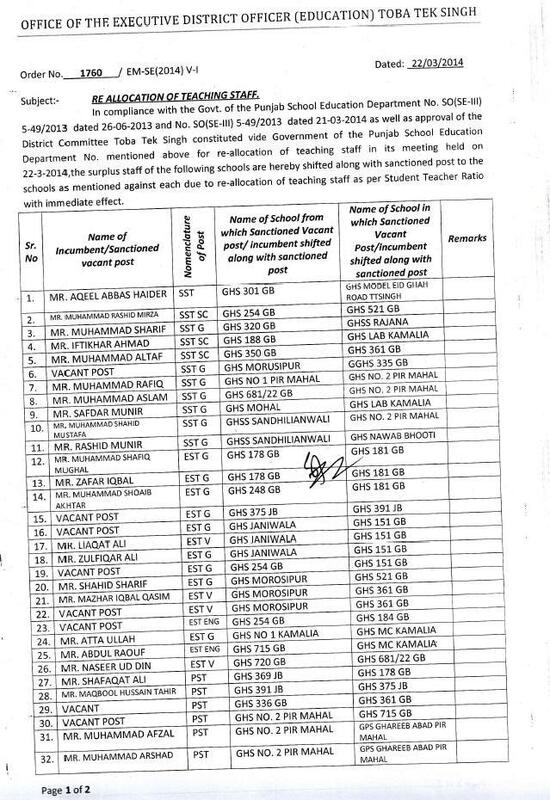 The incumbents shifted are hereby relieved immediately. 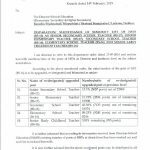 The DEO concerned will ensure their joining at their place of shifting. 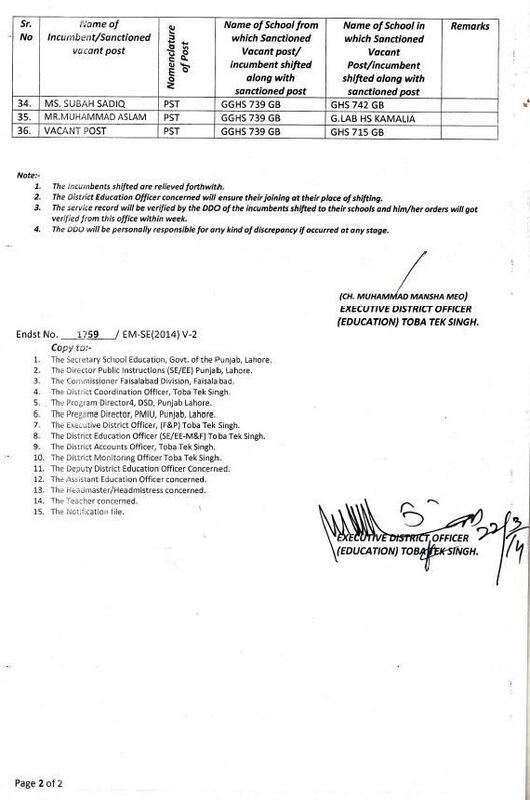 The service record will be verified by the DDO of the incumbents shifted to their schools and him/her orders will got verified from this office within week. 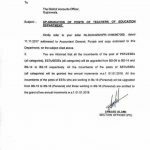 The DDO will be personally responsible for any kind of discrepancy if occurred at any stage. 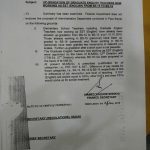 This post has been delivered by Mr. Adnan Umar.